When was the last time you actually sat down with a pen and paper and did a crossword puzzle. Probably years, maybe even never. In recent years it has become more and more common to enjoy the activities we use to do, with physical tools like paper and pen, we can now do much easier thanks to advances in technology. With the iPad Pro and rumored Samsung Galaxy Tablet more and more people are turning to devices for their tactile entertainment needs. Artists and those that love to draw are no exception. Check out some of the best drawing apps and online games. Check out Graphic, a digital drafting a design app that allows you to bring your vision to life with realistic and true to life renderings. This software gives you a range of tools to play with, brushes, presets and filters. It is perfect for designing logos, proposal or for just playing around on. Graphic works on all your devices and allows you to share designs safely and easily. You can find Graphic in the app store. 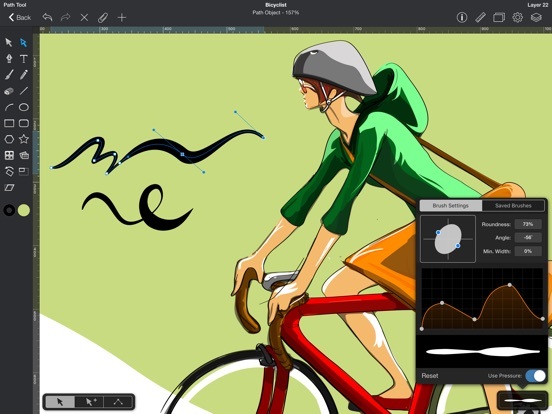 Color Paint Art Studio Pro FX is like classic paints genetically enhanced little brother. It’s bulkier, faster, stronger, and has a plethora of options for you to chose from whether you are making a birthday card or designing an alien landscape. Color Paint Art studio allows you to edit photos, adjust colors, emphasis certain colors and play around in ways you never knew you could. This app even has many of the tools you may be familiar with if you have ever messed around with Photoshop. With lasso, smudge, dodge, burn and color effects you will be able to make any photograph look like it was taken by a real life professional. Or if you are more on the goofy side you can use these tools to insert UFO’s in to your friend’s wedding photos. Color Paint Art studio allows you to call the shots. Draw this is a blast to play. This free online game connects you with gamers and artists from around the world all trying to do one thing. Guess what the other person is drawing. It may sound simple enough but when you only have thirty seconds to guess what someone on the other side of the planet is drawing the pressure builds. No only are you guessing but you are competing against other artists and gamers from all over to be the first to guess the image. Take turns drawing and guessing and see if you can out smart the competition. Quick, Draw! is more than just a fun doodling game, it pits you up against a AI neural network that is learning from every move you make. Created by Google, Quick, Draw! is the worlds largest collection of doodle data. By playing the game, which is fast passed and fun, you are also helping build and expand googles ability to create artificial intelligence that can recognize doodles. The AI is surprisingly good at distinguishing between a guitar and violin even when drawn by finger on a touch pad. It is a pretty impressive system.